Make your yearbook a work of art and of the heart with these yearbook ideas. Yearbooks capture memories and freeze time within their covers. When you slowly turn the pages you see people who helped popularize your yearbook theme ideas, classmates you studied with, played with, danced with and competed against. They are forever frozen in time as young, energetic and forward looking classmates. They were all full of promise! Some look through their yearbooks over time just to remind themselves of what it felt like to be young and hopeful. Time can fade memories. Your yearbook restores the color. Your yearbook serves many purposes, and our yearbook ideas address those purposes. 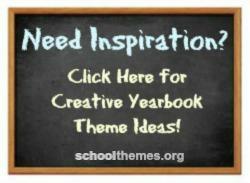 Creative yearbook theme ideas that build school spirit and help achieve performance goals. 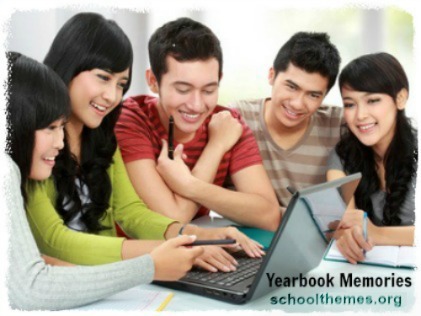 Yearbook copy can be written in various styles, but normally there are two choices – straight reporting and mood copy. Straight reporting is much like it sounds and is written like a newspaper story, starting from most important to least important items. The writing covers an entire year’s school activities, not just one event. As an example, your Pep Club activities will not only cover the assembly held in October, but will also include other assemblies, fund-raising events, sports rallies etc. Your yearbook staff will select the most important events to report as some active clubs do more than can possibly be reported, so they’ll want to pick the most interesting items. Copy should be specific and address only the year being reported. Try not to repeat the previous year’s copy. Your yearbook is a history of a specific year, so stick to that year unless it’s necessary to address the past or future for clarity. Mood copy is a written attempt to convey emotion or action supported by words, graphics, pictures, sayings etc. Yearbook credits give students a chance to gain recognition for their contributions to their school. Club members, honor society students, athletic awards, proms, academic achievements – its all in there. And speaking of yearbooks - "You've Got Friends" is the slogan of the very popular social networking site claiming to be the coolest way of hanging out online and the best way to find out more about the people you see in everyday life. Teamwork Makes the Dream Work - Highlight all the occasions where two or more was better than one in achieving goals, etc. Class Acts - Showcase classy actions witnessed during the year as well as student performances in theater, sports, or academics, and more. Best Friends Forever - Highlight best friends, teams or individuals with the things they love (eg. A group of girls with their phones, a guy looking longingly at a burger). Exercise your creativity and you'll come up with both funny and serious images and stories. 15 Minutes of Fame - Ensure you capture every student engaged in what they are infamous for, but make sure if it's humorous that it isn't also hurtful. Use some sensitivity when making choices. Highlight talents or fun quirks, not weaknesses a student feels uncomfortable about. It's all about building school spirit. Eye of the Tiger - Start the year with student, class and school goals and chronicle how they were achieved. Sweet Memories - Incorporate candy and treats or spoofs of them into every scenario you can. Create fun awards for students and staff to earn and be sure they tie in with candy. Using a theme that threads its way through your book helps connect all the years spent at school. Sometimes it seems as if the time really speeds by and before you know it, the year is over. It's a good thing your plans and ideas for your yearbook do so much more than just record accomplishments. It really is an educational experience. Many participate in preparing yearbooks... and students learn writing, designing and photography. They also learn planning, layout and the sometimes stressful requirement... "meeting deadlines". Yearbook themes reflect the culture of your school, its student body and the hard work involved in creating it. Assembling a yearbook is not easy. Though students do as much of the work as possible, professional help is often still needed.Professional yearbook organizers can assist students with great yearbook project planning. That said, more and more resources are available online for assembling a yearbook online and then bringing it to print. So, the best choice for your school really depends on who you have to organize and manage the project. 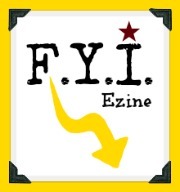 The publication of your yearbook requires the coordinated effort of students, staff and ultimately... the printer. Year-book ideas can be found online if you need extra help. There are hundreds of suggestions for the entire yearbook process, from beginning to end. Using a company that has experience can simplify the process, and ensure a quality product is produced. Each step of the way, professional assistance can lend creative ideas, potentially save money and offer students an opportunity to publish the most unique and creative school yearbook seen in quite some time. 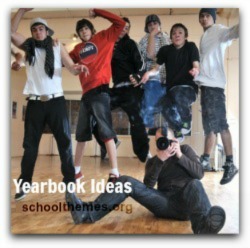 Yearbook ideas range from the simple to the elaborate. They cover everything from how to handle personal photos to final production. 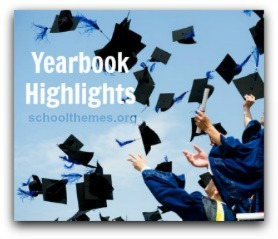 Many yearbook ideas are centered around themes that establish the tone of your book. Every class forms its own personality. And your yearbook should reflect the unique qualities and character of each class. In the end, as you turn the pages of your yearbook, you will get to relive each glorious school year... moment by moment. Show your ingenuity and creativity by transforming your yearbook ideas into a final product that all will treasure. 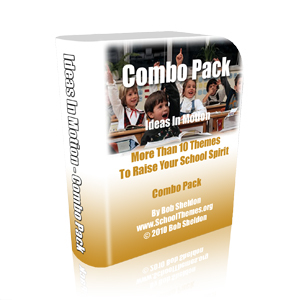 Purpose-driven yearbook ideas and themes that will motivate your school to build an amazing and memorable yearbook together while building school spirit and improving the overall performance of staff and students.